So yeah I’m in hospital. I’ve never been in hospital before. I’m not sure I’ve been missing out, but it’s ok I guess. And I’ve got my own private room! Palatial! Well, I’m sharing it with Clarence the cow of course. Feeling fine (chemo side effects aside), don’t panic everyone. Like actually… people don’t seem to believe me. Don’t worry about wishing I feel better soon, let’s just wish I get out in time to go to New Forest on Saturday (in hindsight we might need to move out spontaneous weekend away to the following weekend now). So I’m in because I had a temperature of 38 degrees and because my immunity (neutrophils… white blood cell stuff) is so low at the moment they need to give me antibiotics and monitor me for 48 hours. Platelets and haemoglobin are low too… so… yeah! Cool. I’m meant to be having an MRI today, so I’m not sure what will happen with that. They gave me a cannula in the back of my hand. Ow. The doctor did it, it took a while. There was lots of crying out in pain. Yeah ok I was wailing, it wasn’t pretty. Now I’ve got constant stinging in my hand, and it hurts every time I move. Thanks guys. They gave me oral morphine and paracetamol for it last night but… didn’t help. IT HURTS. Oh well only a couple more days. I haven’t really eaten in a week thanks to indigestion and now mouth ulcers… But I’m not hungry so I’m not too bothered. Not much else to report right now and my brain is a bit slow and tired this week so no witty anecdotes to add, just an update. Also… It’s bloody freezing in hospital. I’m glad I’ve got my coat for a blanket. Looking forward to my soup and tuna pasta for lunch, and my soup and cottage pie for dinner. Well, what I can eat of them. I’ve got my Kindle and my laptop and Netflix to keep me entertained so I’m all good. I’ll just leave you with one final picture. 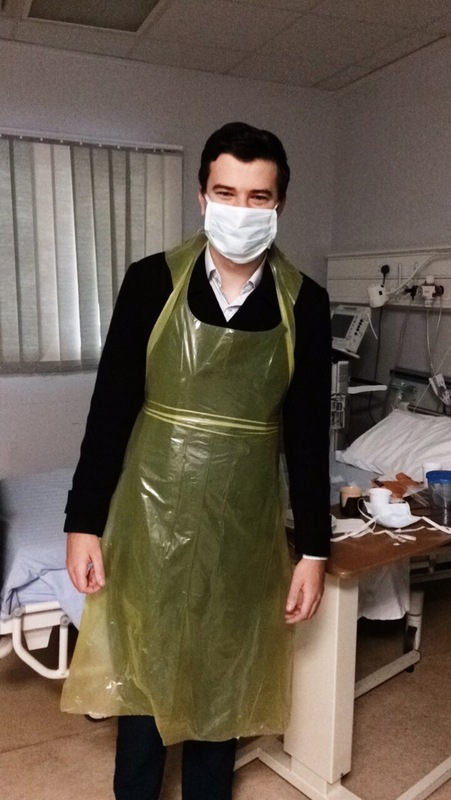 As I’m such a high risk of infection, I’m in isolation so everyone has to mask up when they come in here. So here’s Charlie looking like he’s donned his Halloween costume slightly late. Unfortunately we had to cancel the trip. Oh well, there will be other times! Wow, sounds like you’ve seen a few good concerts lately! I was wondering which date you were going in – I’ll put it in the diary. Mum and Dad arrive around the 30th November. I’m sure they’ll be in touch once they get here! Hope you find the hospital food is to your liking; it sounds good for your conditions. They say small meals, often, for the indigestion. I’m sure they’ll give you another blanket if you ask. Funnily, I also remember feeling really cold in hospital on a rare short stay there once. Maybe they rush around and don’t notice it, whereas the patient lies still. Hope you’re well enough to leave soon. That is unless you’re enjoying just lying back and being waited on! Looking forward to seeing you soon – hope I can make you some food to your liking! The food has been surprisingly good! I got some good tips on what to order today, I’m having curried goat for lunch!!! wow! I got another blanket and a second pillow the next day. I hate asking for things but I’m getting better at it! They definitely keep it quite cool, I guess it’s probably better for managing the spread of disease perhaps? But as you say, it’s when you’re sitting around not doing much that you really feel the cold. Ohhhh cold, I hate being cold especially in bed, maybe Charlie can sneak in an electric blanket or one of those electric bootie things. I will make sure the sun is in full force when you come to visit. Sending big squeezes to keep you warm. Hehe that would be nice, I do have a hot water bottle that is also a soft toy sheep that is a saviour a lot of the time! Thankfully the room they moved me to last night had a heater in it so I was nice and toasty!